Commission Implementing Regulation (EU) No 215/2014 (2) lays down provisions necessary for the preparation of programmes. In order to ensure implementation of the programmes financed by the European Structural and Investment Funds (the ‘ESI Funds’), it is necessary to lay down further provisions for the application of Regulation (EU) No 1303/2013. To facilitate a comprehensive view and the access to those provisions, those provisions should be set out in one implementing act. To increase flexibility in mobilising support for financial instruments from different sources managed by the managing authority in one of the ways set out in the first subparagraph of Article 38(4) of Regulation (EU) No 1303/2013, it is necessary to clarify how the programme contributions are transferred and managed. In particular it is necessary to clarify the circumstances under which a financial instrument may receive contributions from more than one programme or from more than one priority axis or measure of the same programme, and the conditions under which national public or private contributions to financial instruments made at the level of final recipients can be taken into consideration as national co-financing resources. It is necessary to establish a model for reporting on financial instruments to the Commission in order to ensure that the managing authorities provide the information required by Article 46(2) of Regulation (EU) No 1303/2013 in a consistent and comparable way. The model for reporting on financial instruments is also necessary to enable the Commission to provide summaries of the data on progress made in financing and implementing the financial instruments. In order to ensure a harmonised visual identity for information and communication measures for operations in the area of Union cohesion policy, the instructions for creating the Union emblem and a definition of the standard colours should be established, as well as technical characteristics for displaying the Union emblem and the reference to the Fund or Funds supporting the operation. In order to ensure a harmonised visual identity for information and communication measures for infrastructure and construction operations in the area of Union cohesion policy, it is necessary to establish the technical characteristics of billboards and permanent plaques for infrastructure and construction operations where the total public support for each operation exceeds EUR 500 000. For the purposes of Article 125(2)(d) of Regulation (EU) No 1303/2013, it is necessary to lay down technical specifications of the system to record and store in computerised form data on each operation necessary for the monitoring, evaluation, financial management, verification and audit. For the purposes of effective implementation of the second subparagraph of Article 122(3) of Regulation (EU) No 1303/2013, it is necessary to ensure that the technical specifications of the system to record and store data guarantee full interoperability with the system referred to in Article 122(3) of that Regulation, at architectural, technical and semantic level. The detailed technical specifications of the system to record and store data should be sufficiently documented to ensure audit trail of the compliance with the legal requirements. The system to record and store data should also include appropriate search tools and reporting functions in order to be able to easily retrieve and aggregate information stored in it for monitoring, evaluation, financial management, verification and audit purposes. 1. Where contributions from more than one programme or from more than one priority axis or measure of the same programme are made to a financial instrument, the body implementing that financial instrument shall keep a separate account or maintain an adequate accounting code for the contribution from each programme, from each priority axis or measure for reporting and audit purposes. 2. Where national public and private contributions to financial instruments are made at the level of final recipients, in accordance with the Fund-specific rules, the bodies implementing those financial instruments shall manage national public or private contributions constituting national co-financing and made at the level of final recipients in accordance with paragraphs 3 to 6.
national public or private contributions constituting national co-financing and made by private or public entities, reported to the body implementing financial instrument. 4. The bodies implementing financial instruments shall retain overall responsibility for the investment in final recipients including subsequent monitoring of the contributions from programmes in accordance with funding agreements. 5. The bodies implementing financial instruments shall ensure that expenditure covered by the national public or private contributions constituting national co-financing is eligible before declaring it to the managing authority. 6. The bodies implementing financial instruments shall maintain the audit trail for the national public or private contributions constituting national co-financing down to the level of the final recipient. For the specific report referred to in Article 46(1) of Regulation (EU) No 1303/2013, the managing authorities shall use the model set out in Annex I to this Regulation. The Union emblem shall be created in accordance with the graphic standards set out in Annex II. 1. The Union emblem referred to in point 1(a) of Section 2.2 of Annex XII to Regulation (EU) No 1303/2013 shall be displayed in colour on websites. In all other media, colour shall be used whenever possible and a monochrome version may only be used in justified cases. 2. The Union emblem shall always be clearly visible and placed in a prominent position. Its position and size shall be appropriate to the scale of the material or document being used. For small promotional objects the obligation to make reference to the Fund shall not apply. the reference to the relevant Fund shall be made visible on the same website. 4. The name ‘European Union’ shall always be spelled out in full. The name of a financial instrument shall include a reference to the fact that it is supported by the ESI Funds. The typeface to be used in conjunction with the Union emblem may be any of the following fonts: Arial, Auto, Calibri, Garamond, Trebuchet, Tahoma, Verdana, Ubuntu. Italic, underlined variations or font effects shall not be used. The positioning of the text in relation to the Union emblem shall not interfere with the Union emblem in any way. The font size used shall be proportionate to the size of the emblem. The colour of the font shall be reflex blue, black or white depending on the background. 5. If other logos are displayed in addition to the Union emblem, the Union emblem shall have at least the same size, measured in height or width, as the biggest of the other logos. 1. The name of the operation, the main objective of the operation, the Union emblem together with the reference to the Union and the reference to the Fund or Funds to be displayed on the temporary billboard referred to in point 4 of Section 2.2 of Annex XII to Regulation (EU) No 1303/2013 shall take up at least 25 % of that billboard. 2. The name of the operation and the main objective of the activity supported by the operation, the Union emblem together with the reference to the Union and the reference to the Fund or Funds to be displayed on the permanent plaque or permanent billboard referred to in point 5 of Section 2.2 of Annex XII to Regulation (EU) No 1303/2013 shall take up at least 25 % of that plaque or billboard. The system to record and store data on operations referred to in point (d) of Article 125(2) of Regulation (EU) No 1303/2013 shall comply with the technical specifications set out in Articles 7 to 11. 1. Access to the system shall be based on predefined rights for different types of users and shall be suppressed where it is no longer needed. 2. The system shall keep the logs of any recording, modification and deletion of documents and data. 3. The system shall not allow modification of the content of documents bearing an electronic signature. A time stamp certifying the deposit of the document bearing an electronic signature, shall be generated and associated with the document and shall not be alterable. Deletion of such documents shall be logged in accordance with paragraph 2. 4. The data shall be subject to regular back-ups. The back-up with replica of the entire content of the electronic file repository shall be ready for use in case of emergency. 5. The electronic storage facility shall be protected against any danger of loss or alteration of its integrity. Such protection shall include physical protection against inappropriate temperature and levels of humidity, fire and theft detection systems, adequate protection systems against virus attacks, hackers and any other non-authorised access. 6. The system shall provide for the migration of data, format and computer environment at intervals sufficient to guarantee legibility and accessibility of documents and data until the end of the relevant period referred to in Article 140(1) of Regulation (EU) No 1303/2013. 1. The system shall be interoperable with the systems for electronic data exchange with beneficiaries referred to in Article 122(3) of Regulation (EU) No 1303/2013. Where appropriate, the system shall facilitate the verification of the veracity and, completeness of the data provided by the beneficiaries before it is stored in a secured manner. 2. The system shall be interoperable with other relevant computerised systems under the National Interoperability Framework and the European Interoperability Framework (EIF) established under Decision No 922/2009/EC of the European Parliament and of the Council (3). 3. The system shall be interoperable at technical and semantic level. The specifications shall support standard formats for data exchange and shall ensure that those formats can be recognised and exchanged between heterogeneous systems. a possibility of saving, exporting or printing reports referred to in point (b), or a link to an external application providing for such possibility. The managing authority shall provide detailed and updated functional and technical documentation on the operation and characteristics of the system, accessible on request by relevant entities responsible for the management of the programme, by the Commission and the European Court of Auditors. The documentation referred to in the first paragraph shall provide evidence of the implementation of Regulation (EU) No 1303/2013 in the Member State concerned. The system used shall be protected by adequate security measures concerning document classification, protection of information systems and personal data protection. These measures shall comply with international standards and national legal requirements. The security measures referred to in the first paragraph shall protect networks and transmission facilities where the system interacts with other modules and systems. Done at Brussels, 28 July2014. (2) Commission Implementing Regulation (EU) No 215/2014 of 7 March 2014 laying down rules for implementing Regulation (EU) No 1303/2013 of the European Parliament and of the Council laying down common provisions on the European Regional Development Fund, the European Social Fund, the Cohesion Fund, the European Agricultural Fund for Rural Development and the European Maritime and Fisheries Fund and laying down general provisions on the European Regional Development Fund, the European Social Fund, the Cohesion Fund and the European Maritime and Fisheries Fund with regard to methodologies for climate change support, the determination of milestones and targets in the performance framework and the nomenclature of categories of intervention for the European Structural and Investment Funds (OJ L 69, 8.3.2014, p. 65). (3) Decision No 922/2009/EC of the European Parliament and of the Council of 16 September 2009 on interoperability solutions for European public administrations (ISA) (OJ L 260, 3.10.2009, p. 20). (4) Commission Delegated Regulation (EU) No 480/2014 of 3 March 2014 supplementing Regulation (EU) No 1303/2013 of the European Parliament and of the Council laying down common provisions on the European Regional Development Fund, the European Social Fund, the Cohesion Fund, the European Agricultural Fund for Rural Development and the European Maritime and Fisheries Fund and laying down general provisions on the European Regional Development Fund, the European Social Fund, the Cohesion Fund and the European Maritime and Fisheries Fund (OJ L 138, 13.5.2014, p. 5). (1) This includes the YEI specific allocation and the matching ESF support. Against a background of blue sky, twelve golden stars form a circle representing the union of the peoples of Europe. The number of stars is fixed, twelve being the symbol of perfection and unity. The emblem has the form of a blue rectangular flag of which the fly is one and a half times the length of the hoist. 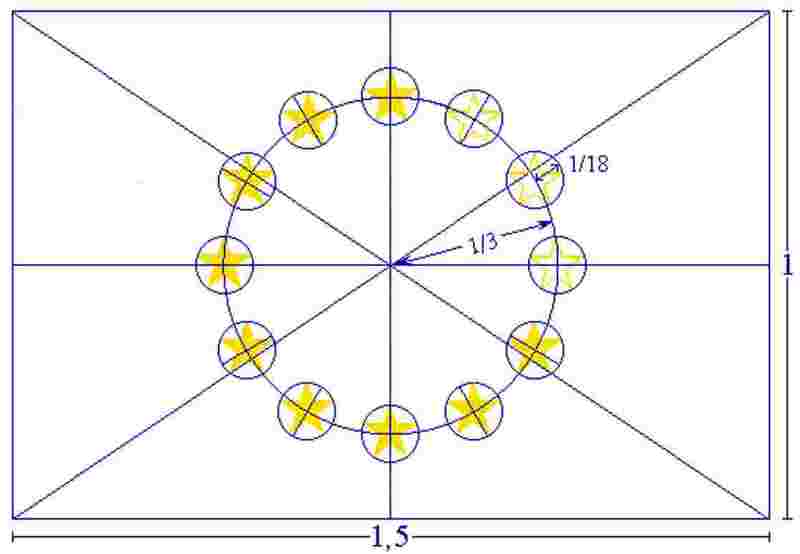 Twelve gold stars situated at equal intervals form an invisible circle whose center is the point of intersection of the diagonals of the rectangle. The radius of the circle is equal to one third of the height of the hoist. Each of the stars has five points which are situated on the circumference of an invisible circle whose radius is equal to one eighteenth of the height of the hoist. All the stars are upright, i.e. with one point vertical and two points in a straight line at right angles to the mast. The circle is arranged so that the stars appear in the position of the hours on the face of a clock. Their number is invariable. PANTONE REFLEX BLUE corresponds in the web-palette colour RGB:0/51/153 (hexadecimal: 003399) and PANTONE YELLOW corresponds in the web-palette colour RGB: 255/204/0 (hexadecimal: FFCC00).